Ottawa’s gotten a little wild thanks to the pair or parrots and a boa constrictor on the lam in Ottawa. The latest was what Redditors identified as a Senegal parrot spotted at 875 Heron Road Monday morning. “The folks around here are saying there are falcons nearby who start hunting around 9, scared for this little guy,” wrote one worried pet lover on the Ottawa and Valley Lost Pets Facebook page. ****UPDATE: Murphy, the boa constrictor, has been found! 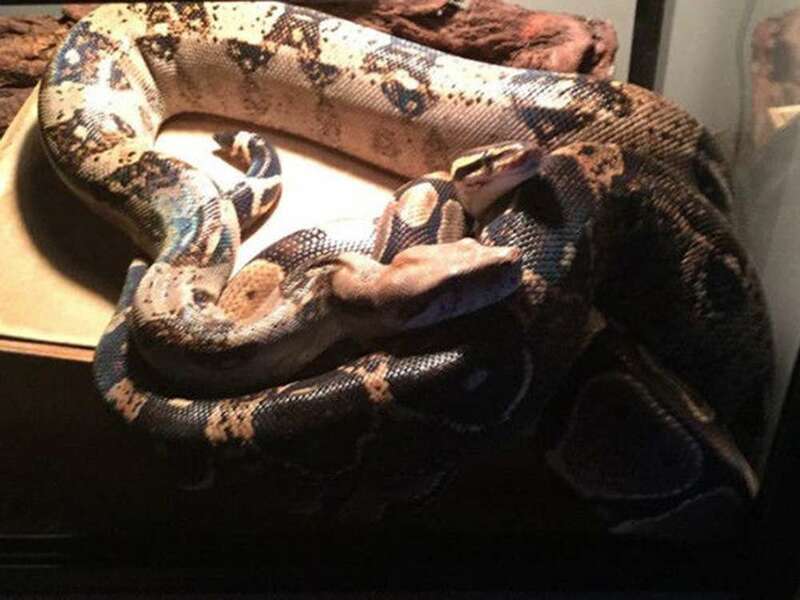 Over the weekend, the buzz was a lost boa constrictor in Westboro. City Coun. Jeff Leiper warned folks Sunday night to watch for a five-foot-long reptile missing from a home on Lanark Avenue in the Westboro Beach area. The reportedly “calm and friendly” Murphy hadn’t been seen since Saturday. “Kind of weird to be enjoying a beer on the back patio while keeping an eye out for a boa constrictor,” one resident replied on Twitter. “Kitchissippi. I love this ward,” Leiper tweeted. In case you’re wondering: City bylaws ban people from keeping some snakes, including cobras and vipers as pets, but members of the family Boidae — which includes boa constrictors — are okay if they are small. And by “small,” that means they reach an adult length of less than 2 metres. Owner Karen Genge has had Murphy, a Nicaraguan dwarf boa, for a decade since he was abandoned at the reptile rescue where she volunteered and says he is well under the 2-metre limit. “He’s never been outside — he’ll be terrified,” Genge said of her “timid” pet. She thinks he likely slithered out of a door left ajar for the cats. His diet consists of small rats she buys frozen. **UPDATE: Marty has been found! Finally, have you seen Marty? 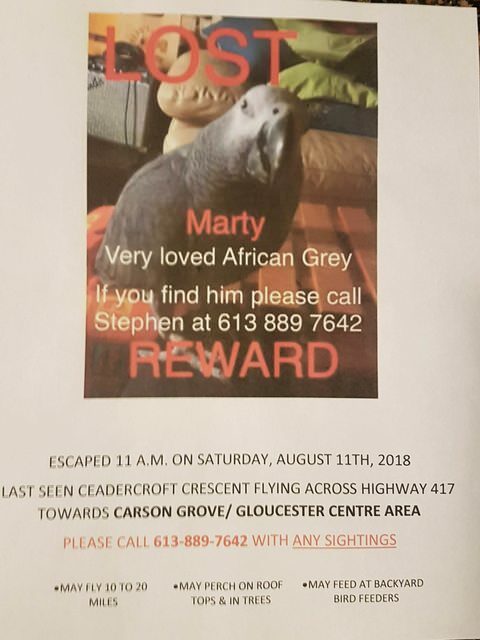 The “very loved” African grey parrot was last seen Saturday morning flying across the Queensway towards the Cedar Grove and Gloucester Centre area. The birds can fly 10 to 20 miles and may perch on rooftops or in trees or be spotted in backyard bird feeders, the worried owner said in a flyer that was posted on Reddit. Wednesday afternoon, OC Transpo tweeted about a “cockatoo” found outside its headquarters on St. Laurent Boulevard, asking for the bird’s owner to give them a call. Within minutes, social media worked its magic. The tweet was forwarded to the Ottawa and Valley Lost Pet Network, which operates a website aimed at reuniting lost pets and their owners. 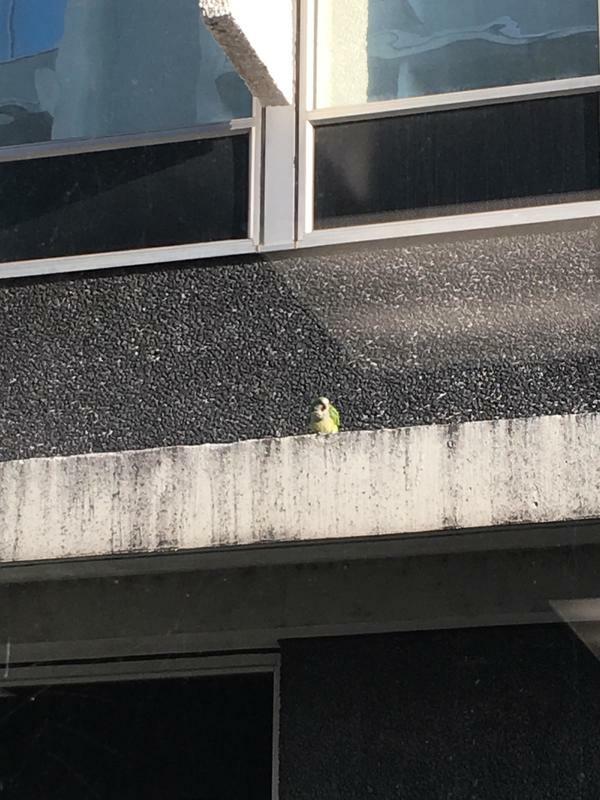 It turns out a posting about the bird (actually, it was a cockatiel, a smaller cousin of the cockatoo) had been put on the website over the weekend after he went missing during a fire alarm in an Ogilvy Road apartment building. Within hours on Wednesday, Blue the cockatiel and his owner, Amber Glasner, were back together. Glasner says she has been frantic since Blue disappeared on Saturday. Cockatiels are native to Australia, and can’t survive colder weather. But a tame cockatiel might also be prey to cats, or get injured in traffic. Glasner’s roommate had taken to social media, and put up posters about the missing bird. Glasner walked around whistling, but she couldn’t find Blue. OC Transpo’s manager of customer services David Pepper says an employee noticed something being attacked by four crows. Thinking it was a baby pigeon, the employee pulled up, then saw it was a cockatiel. The employee reached over with a hand extended and Blue jumped on. Glasner was at work Wednesday night when her roommate learned that a bird fitting Blue’s description had been found. An OC Transpo employee delivered Blue right to her apartment. Jennifer Perrier-Raina, an administrator at the Lost Pet Network, says the four-year-old website gets about 20 new postings each day. About 130 cats are still missing from July alone, and about 100 dogs since the beginning of the year. The Lost Pet Network posts about 600 “happy endings” every month. But Blue’s story is one of the more unusual ones. “It’s not often you see people finding cockatiels,” says Perrier-Raina. It’s unclear what adventures Blue encountered while he was at large. He has a scratch above his right eye, says Glanser. Milo the service dog is home! (Thank you to Sandy Sharkey, boom 99.7 Ottawa for providing the story). "Sue Perry, originally from P.E.I. has been deaf since birth, but a little black spaniel named Milo helped her with challenges by being a loyal service dog as well as a best friend. Sue was living in Ottawa when Milo went missing back in July. After much searching, contacting the Humane Society, and pet agencies, Sue gave up hope of ever seeing Milo again. She recently moved to Fredericton New Brunswick to live with her uncle. Just before Christmas, a volunteer with the Ottawa Valley Lost Pet Network spotted Milo on an SPCA website. The only problem: Milo had already been adopted by Nicolas Adam, his wife and two young daughters. The family talked it over then decided that they had to do the right thing- as hard as it was, they agreed to release Milo back to Sue Perry. Ottawa residents Becky Baxter and her boyfriend Kyle Turner volunteered to drive Milo from Ottawa to Fredericton, a two day road-trip that ended in Sue Perry’s driveway. Lots of tears and tail wagging as Milo was finally re-united with Sue. And, as a footnote to this wonderful story, the Adams family have since adopted a new dog named Sammy. Click on link to view the touching reunion of Sue and Milo." Looking for my dog Blue. My name is Emily and I am nine years old. 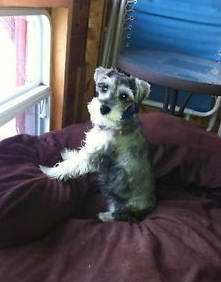 My dog Blue got lost from our farm in Russell, Ont., on May 25 when I let him out for his pee in the morning. We live on a big farm and I go out every day looking for him, but he has not come home yet. My mom and dad told me Blue might not come home and it makes me cry he is my best friend in the hole world. I am writing this note to you because mom told me we need to tell as many people as we can in the whole world so if someone has Blue maybe they will bring him home to me. The owner of a missing cat named Buddha decided a large graffiti wall in downtown Ottawa would be the perfect place to ask for help. 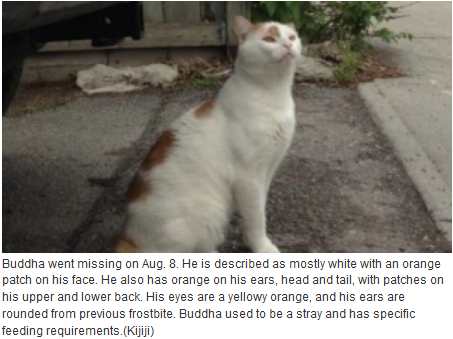 Buddha went missing on Aug. 8. He is described as mostly white with an orange patch on his face. He also has orange on his ears, head and tail, with patches on his upper and lower back. His eyes are a yellowy orange, and his ears are rounded from previous frostbite. Buddha used to be a stray and has specific feeding requirements. (Kijiji)The mural was painted late Sunday night on the far east side of a dedicated graffiti wall on Slater Street, near the Bay Street bus stop. Every day, hundreds of OC Transpo buses with thousands of riders pass by the highly visible wall of graffiti art. It took Buddha's owner, Kayleigh Julien, and her two friends about five hours to create the mural, which stands about four metres tall and nine metres wide. Julien told CBC News she rescued the stray cat in the winter nearly two years ago. The cat disappeared after Julien moved from Gatineau's Hull neighbourhood to downtown Ottawa. "I'm afraid people might think he's a stray because he used to live on the street for so long. He was out for an entire winter at one point. He had frostbitten paws when I took him in. I had to nurse him back to health," Julien said. "He had been outside for a number of months. His paws were completely black. His ears were completely black. His eye was completely infected shut. It took us months to heal him back to health." 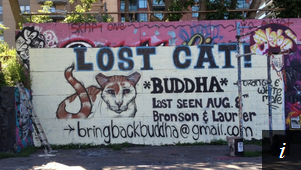 Buddha was wearing a leopard-print collar when he was last seen on Aug. 8. Woman, with help from the network, reunites with lost dog after more than a year. Family reunited with missing dog after one year. More than a year-and-a-half ago, Hope Cadieux opened the door for her dog, Nekita, like she had so many times before, so the husky mix could take a run on the family’s St. Albert farm. Nekita never came back. But two weeks ago, with the help of the Ottawa and Valley Lost Pet Network, that lost cause became a found dog. “They gave me hope when I didn’t have any,” says Cadieux of the Facebook page where she posted a picture of the husky border collie cross and its two puppies that went missing in January 2013. Days later, one puppy came back but the other, Ace, is still missing. Up until early July, that was Nekita’s story, too. “I thought we would never see her again,” says the 18-year-old of the first dog she bought with her own money. One of those miracle workers is founder Gisele Villeneuve, who started the page in December 2012. Before, Villeneuve managed a lost pet group closer to her home in Renfrew, but she thought, given how far animals can roam, the group’s reach needed to be wider. “You never know where a lost pet will end up,” says Villeneuve, who owns four dogs. Since then the page has grown to more than 10,000 likes. She says the site tracked more than 150 reunions of pets and their owners in the first five months of 2014. They’ve since stopped counting. “We have to go through hundreds of notifications every day,” she says, adding the group contacts the owners with any leads posted to make sure all leads are followed up. Villeneuve manages the page part-time with 15 other administrators, four of whom volunteer full time. Villeneuve lists success stories like so many memories. There have been feral dogs, caught and adopted or returned. An orange cat, missing for two years, returned to a “little boy who was heartbroken.” And then there was a woman who searched for a stranger’s dog for three days because the Ottawa owner was stuck in Ottawa. She found the dog. There was also Katy Meredith, who lost her cat on her wedding day. Because of the network, Max was home three days later. “It’s just amazing. They reconnect animals every day, and people need to know that because those people are the ones who are going to find your pet.” Now Meredith is a regular poster, and hopes more in the Ottawa Valley will like the page and keep an eye out for missing pets. The organization even posts when deceased animals are found because it can give the family closure. Villeneuve is quick to add it’s important to report through the proper channels as well, like the local animal shelter or the Ottawa Humane Society. She also stresses that a microchip is important to help bylaw officers identify lost and stolen pets. Love our Ottawa Firefighters! They rescued this little dog from a tree in the Ottawa River this afternoon (Jean D'Arc & 10th Line area). One firefighter recognized the dog from Facebook and is reuniting her with her owners! - Wendy Daniels. Embraced by the Pontiac people Before March 8, I couldn’t imagine the anguish of a lost pet. We learned how heart wrenching that could be on our spring break vacation. We traveled to the Pontiac region from London Ontario to visit friends and family and took our two dogs, Lady and Luka. On arriving, we entered the house but Luka squeezed out the door before it closed. He took off up the lane way, and disappeared into the night. With the help of family and friends we hunted until early morning. My daughters turned to social media for comfort. Family and friends “shared” their posts and asked people to keep their eyes open. We searched for the remainder of our 3 day visit and I posted a lost pet ad on Kijiji. The response was overwhelming as my ad had been seen by several lost pet networks (Pontiac Animal Aide, Ottawa and Valley Lost Pet Network) who alerted their volunteers to be on the lookout. We had to head home, not knowing where he was or if he was OK but constant emails from complete strangers kept our hopes alive. We headed back to Quyon, March 14, to search. While driving, we spotted him, but he disappeared into the woods. After a weekend stay, we once again headed back home. My phone rang, March 19, and the voice on the other end was music to my ears. She said, “I think I have your dog.” She reassured me she would take care of him until we could make arrangements to pick him up. I can’t say enough about the Pontiac region’s people. We deeply thank everyone who helped in one way or another. We thank Animal Aide Pontiac’s volunteers for their support and help. I encourage everyone who has time or space in their families to contact them to be a volunteer or foster family for a pet in need. Back in April 2013 with only a few months in existence Ottawa and Valley Lost Pet Network was already an AWESOME network with only some 600 likes it brought wonderful and amazing people together and they were able to rescue Becky of Highway 29. She had been running scared for five long winter months. Her owners had given up on her soon after she went missing. Becky now named April is now living the dream with her hero who rescued her, Natalie. Click on the Facebook link to read about Becky. Missing pets are being reunited thanks to the Ottawa and Valley Lost Pet Network. The network is using Facebook (www.facebook.com/lostpetnetwork) and Twitter (@ottawalostpet) to get the word out about lost pets. The network is urging people to check out its Facebook. For more on the network, visit the website www.ottawaandvalleylostpetnetwork.ca. ﻿Carleton Place Almonte Canadian Gazette﻿ by Derek Dunn News - One dog lover is going to great lengths to find her long lost companions. Amy Robillard was at home in Fitzroy Harbour with her father and two "puggles," a mix of pug and beagle on June 22. The tan and black, short-legged, long-backed buddies wanted out to do their business at the usual time, about 8 p.m. While Jackson, 6, a male, and Bailey, 3, a female, sometimes go off exploring the ravine near the water for a time, they usually return quite quickly. However, on this Saturday evening the rain may have washed away scents that would have guided them back home. Adding to the series of factors culminating against the dogs was the fact they weren't wearing collars. Guilt for not putting on their collars brings tears to Robillard's eyes. She and fiance Brent LaBrie built their relationship, in part, on raising the dogs for the last three years. "They are like our family," she said. "They are like our kids." Which is why she continues to hold out hope almost two months later that her friends will be found safe and sound. Robillard is offering a $1,000 reward for Jackson and Bailey's return. Another 1,000 posters appear in all points of West Carleton and beyond. She's knocked on countless doors, and keeps tabs on various Internet sites such as helpinglostpets.com and Facebook's Ottawa and Valley Lost Pet Network. She marvels that dog lovers stick together, with complete strangers doing all they can to help. She has followed up on numerous tips. "I've pretty much found everybody else's dogs," she said. While the drive to and from tipster's has been emotional, she welcomes more. "It's definitely tough, but you have to do it anyway," she said. "The possibility it could be them is there." Dogfighting ring? If the dogs are still alive, it is highly likely they are with someone who believes they were abandoned. They might not know that Jackson is microchipped. However, Ottawa police and Renfrew OPP say there is no secret dogfighting ring in the area, despite numerous rumours to the contrary. Some in West Carleton say a rash of dognappings - particularly of small dogs - has taken place, leading them to the conclusion that their dogs have been used as bait. There is a possibility that the dogs are in the Carp area. Robillard has heard that a woman walks two puggles at the fairgrounds. She has yet to connect with the woman, but hopes to soon. Even if this latest tip doesn't pan out, Robillard won't be deterred. "They are together and alive," she said. Anyone with information can reach Robillard at 613-203-4487.